We were finalists in the Dell Business Plan Challenge put together by Dell and FIRST in Texas. This summer competition was designed to allow FRC teams to better their presentation skills while displaying FIRST front and center before of Dell's executive team. Teams would present their outreach ideas to them in hopes of receiving $3,000 to make their goals a reality. The other two finalists would both receive $500. Since this is the first time an event like this has taken place, we want to provide some details so that other teams can be more prepared for similar events in the future. The competition was announced on June 2nd. The requirements for entering the competition were emailed out to teams in Texas and posted on the FIRST in Texas Website here and in this presentation. All of this had to be done in under three weeks which was not a lot of time. Luckily this was something we wanted to do so we made time for it. Here is our initial submission package to Dell. The video was a blast to shoot. We didn't have time to memorize our presentation so we set up a system that allowed us to use one of our member's iPads as a teleprompter. Here is a behind the scenes shot of the presentation filming. We shone light from a halogen work lamp on an old presentation board and an old sponsor check which reflected the light onto the presenters. The teleprompter was merely an iPad supported by some foam we had lying around. Both presenters wore microphones plugged into a headphone splinter connected to the DSLR camera we used for filming. We shot the whole video in one of our school stairwells from about 8:30pm-10:30pm. We submitted our information on June 19th since we were setting up for the Texas Robotics Invitational on June 20th and would be unable to work on it. On July 2nd we were notified that we were one of the three finalists in the competition. At the time we did not know who the other two finalist were, but we quickly learned that they were our friends FRC#2881 and FRC#418 both from Austin. We had several conference calls throughout the process detailing how the final stage of the competition would be handled. We learned that on July 15th we would be presenting directly to the Dell Executive Leadership which included Michael Dell himself, the very top of the Dell corporate structure. The competition would be similar to the television show Shark Tank, since we would be pitching our outreach ideas to compete for the $3,000. This timing was not perfect since the time we would normally use to prepare for an event like this had already been committed to running our SPECTaculaR summer course at a local Boys and Girls as well as the Texas Mentor Workshop the Friday and Saturday before the event. That basically meant we would have as little as two days to prepare for the competition. We did what we could beforehand but with many events and a few of our key team members traveling during that time it wasn't easy. We worked the night of 13th and left for Austin Monday afternoon. When we go to our hotel room we went straight to work ironing out the presentation script, designing the slides, and making the leave behind. Our proposal in a nut shell was to purchase robotics kits for the organizations that we work with so that they can continue the STEM development during the months that we don't work with their students. The competition was held at Austin's Thinkery, something akin to a children's museum. FRC#2468 Team Appreciate played a huge part in bringing this event into existence and they were there providing logistical support for the event. 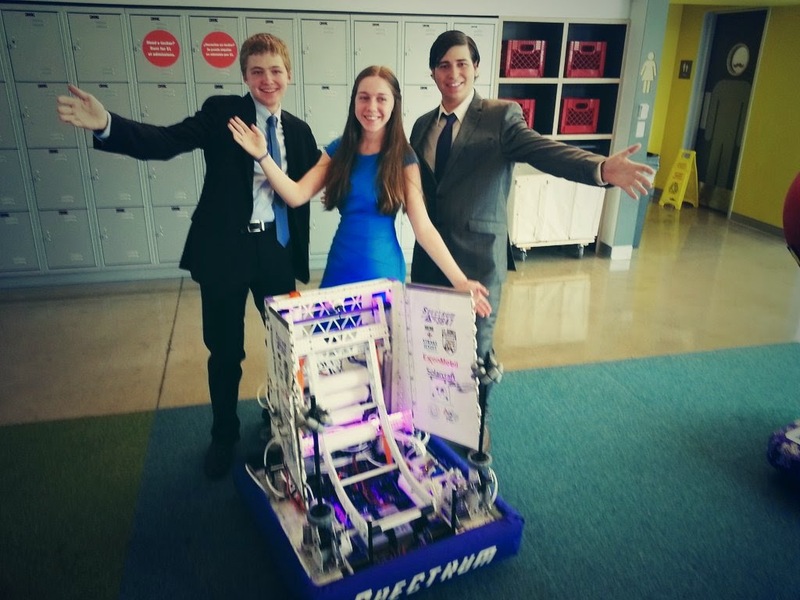 After we did introductions, we did a short demonstration of the robots before we presenting to the judges. Our presentation team did an awesome job. We weren't allowed to watch the presentation by the other teams but from what we heard they all did a fantastic job and had wonderful ideas for how we can better reach out to students and get them inspired to pursue STEM in their futures. In the end the award went to FRC#2881 The Lady Cans. The judges said that they had a great idea and back it up with a strong plan for measuring their success. Congratulations to them on winning the event and congratulations to LASA FRC#418 for making it to the finals as well. Thank you to Dell and FIRST in Texas for putting on such a great event. Our team had an awesome time and it's always nice to see our friends from Austin. 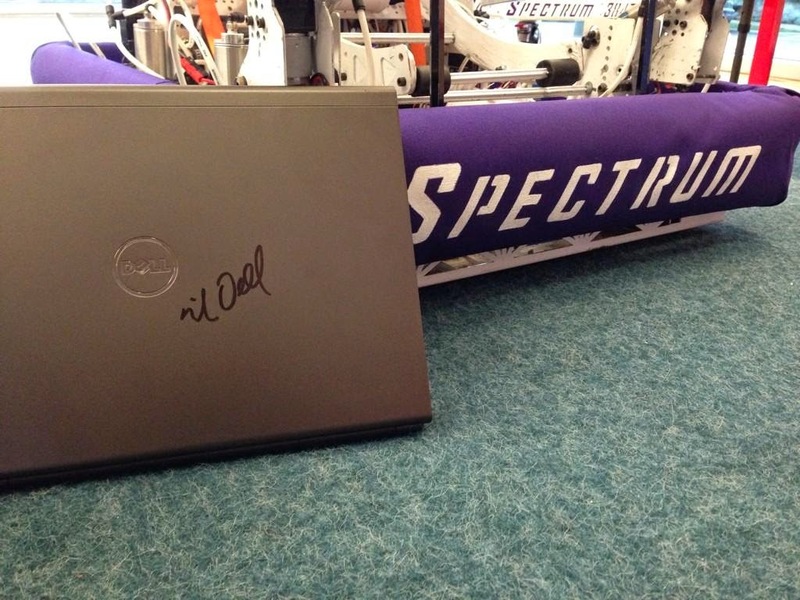 We even got Michael Dell's autograph. Dell had their media team on hand to film the presentations and we'll be sure to send out a link once they get that out to us.